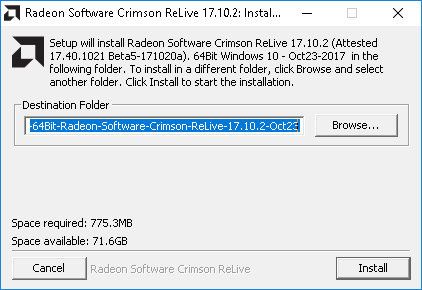 The latest AMD Radeon Software Crimson ReLive Edition 17.10.2 drives come with some interesting new features not only for games, but for compute use (including mining). The two of the interesting highlights regarding mining use are the GPU Workload option as well as up to 12 GPU Compute Support (only for Windows 10). This may open up more options to users using Windows 10 for mining rigs with more than 8 GPUs, at least if they are using AMD-based video cards and maybe soon we are going to see similar feature also provided by Nvidia as apparently the video drivers are capable of driving more than 8 GPUs under Windows 10 as AMD is showing. A new toggle in Radeon Settings that can be found under the “Gaming”, “Global Settings” options. This toggle will allow you to switch optimization between graphics or compute workloads on select Radeon RX 500 and Radeon RX 400 series graphics products. Radeon Software now supports compute workloads for up to 12 installed Radeon RX 400, Radeon RX 500 or Radeon RX Vega series graphics products on Windows 10 system configurations. It is not yet clear if there will be some performance improvement when using the compute workloads option as opposed to the gaming option, this will need to be tested. The up to 12 GPUs support for Radeon RX series of GPUs under Windows 10 is much more interesting for the miners that are already building mining rigs with motherboards supporting 12 or more GPUs. Do note that this feature apparently supports only AMD Radeon RX series of GPUs and not older models, but it also seems that the up to 4 VEGA GPUs limitation should also not be a problem anymore. Again this of course needs testing for a confirmation, so if you check any of these new features in the latest AMD video drivers feel free to report your results in the comments below. Do note that according to AMD GPU Workload feature may cause a system hang when switching to Compute while AMD CrossFire is active, not that you would need to have Crossfire enabled at all for mining, but just be sure that it is disabled if your motherboard supports that. The Radeon Wattman should also give you less trouble when overclocking/underclocking the GPU, though probably not everything is fully resolved.